The Division 2 is everything you expect from a good sequel, that much is easy to discern. Followers of the original are already on board to sink another 200 or so hours into it, but it’s how The Division 2 can turn the apathetic into fans that’s worth exploring. I started the original game twice. First, I did it on Xbox at launch, where a combination of 30fps, lag, and gameplay that mostly revolved around sitting behind cover was enough to get me to stop even before seeing the full story through. Over a year later, I restarted it on PC using my preferred control method as it ran at much higher frame rates. 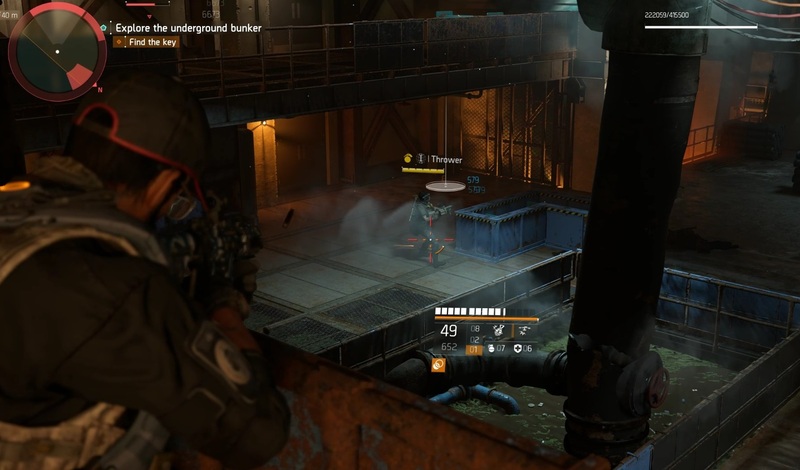 By that point, The Division had gone through its various overhauling updates; and I certainly found a more rewarding, albeit not that much more interesting game. As impressed as I was with how far the game had grown in that time, it was never enough to keep me coming back. I decided instead to wait for the sequel, to hopefully restart this venture along with everybody else. My time with the various Division 2 beta tests only made me more excited, so I was eager to jump in as soon as I could at launch. For 30 or so hours, The Division 2 consistently demonstrated how much more improved every facet of its design has. To say it made a good impression is an understatement; it was as if Massive and co. were determined for the sequel to stand on its own. There’s plenty to appreciate about The Division 2. Its more rewarding loot, meaty activities and varied mission environments all help, but nothing turned my opinion quite like its combat. 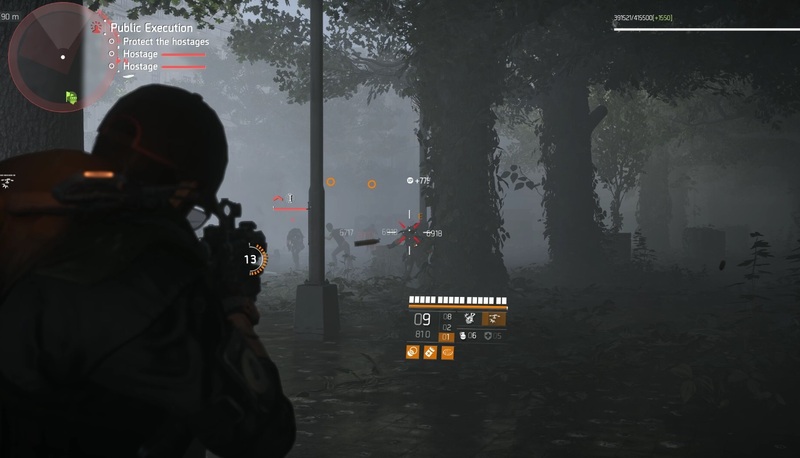 It can never be overstated how combat in a loot shooter like The Division 2 can make or break the game. It’s the one thing you’ll be spending most of your time doing, so it needs to remain relevant hundreds of hours in. The Division 2 upends its predecessor’s encounter design, turning the lethargic, cowering-behind-cover affair of the original into a more active – and even tactical – experience that offers a good challenge every time. It was necessary, too. Where competitors like Destiny, and Warframe can rely on a sci-fi setting to fuel their power fantasies, The Division 2’s real-world setting inevitably sets a much lower ceiling when it comes to weapons, skills and even mission scenarios. Injecting such a grounded experience with Destiny DNA would have ultimately been a poor decision, so the developer needed to find a niche and do it well. Having now fought The Division 2’s three main factions in their various configurations, I am starting to see how the team pulled this off. The most obvious culprit is AI, and enemy behaviour. From the smallest groups you come across as you explore the world, to the most entrenched squads typical in story missions, every encounter can easily send you back to the spawn menu. A momentary lapse of attention is all it takes. Enemy combatants will constantly flank you, requiring you to relocate on a regular basis. 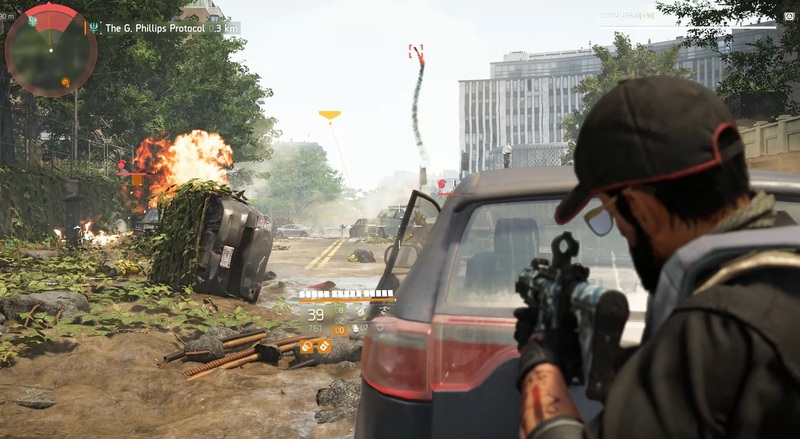 Rather than rely on grenade spam to achieve the same effect, The Division 2’s enemies are capable of putting the pressure on in a few different ways; no one spot is safe. This is true for all enemy types across all factions, but rushers are really the most aggressive I have seen in a game of this kind. This archetype isn’t itself a novelty, but they’re more lethal here because every other archetype is capable of flanking. When both of your flanks are being pushed, an enemy coming straight at you is immediately more dangerous. You can’t just run away if you know others are waiting for you to leave cover. Though you can often see – or hear – rushers coming a mile off, you don’t always get the chance to deal with them. As you’re busy dealing with threats in close to medium range, snipers and other long-range types are ready to punish your every uncalculated move. They’re also surprisingly happy to move to a better spot if they can’t quite get a good shot. Likewise, common soldiers know when to press the advantage and when to retreat. The medic class is a master at this, often cancelling revive trips to return to cover upon realising the situation is dire. Each faction brings something different to the table, and it’s clear a lot of thought went into making their engagement tactics distinct, even more so than their outfits. The military-trained True Sons are always organised in their approach, often calling out their moves to teammates – and as a way of subtly alerting you. One of their units will sometimes go prone to suppress you, shutting down certain routes. The first time I saw one of those I figured it’d be the easiest kill of them all. After all, it’s a stationary AI target and I’m using a mouse! If you ignore the suppression effect their rain of fire creates, you’ll quickly realise that you can’t take them head on. Their armour covers the head and upper chest area effectively, meaning they’re more protected while prone thanks to the much smaller profile. The easy solution is, obviously, to flank. These guys are never alone, of course, so you may not always get a chance to do this. This synergy and interplay between the different subclasses is what adds a layer of unpredictability to each firefight. You’re never really safe, and never truly in control. They all work together to create one of the most active enemy AI I have ever seen. There’s always something happening, someone making a move. The Hyenas, and the Outcasts each have quirks of their own, dictating how they fight. It’s been fascinating to learn and slowly come to appreciate the best ways to deal with each faction, even if they generally all rely on the same archetypes. 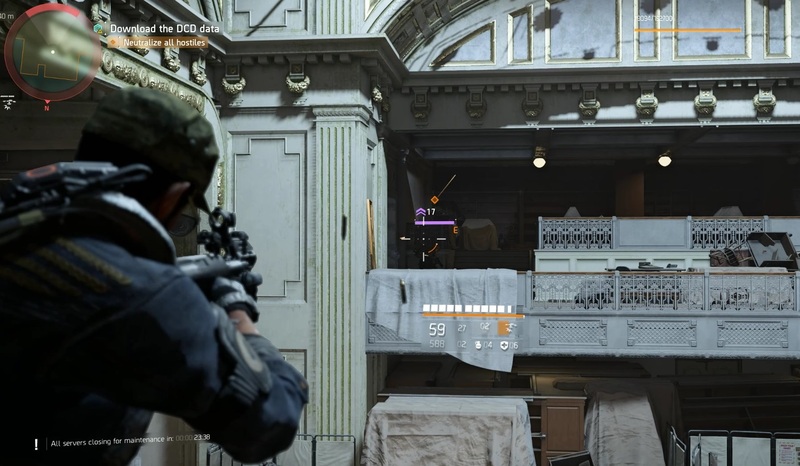 The Division 2 tries to compensate for this increase in enemy lethality with a new armour and health system, but you can only really stay afloat by relying on your skills. I initially picked Pulse, since it was my go-to in the original game, and because it’s basic enough that you’ll always find a use for it. Pulse is nowhere near as powerful in the sequel, though, due to a combination of a hard nerf to its range, and the fact enemies and lootable items in the sequel are easier to spot. This lead me to experiment with the other platforms, which proved much more useful. The different skill platforms ensure that you can use each of them defensively or offensively, while leaving enough room for experimentation. For instance, a stationary turret can be used to slow down rushers, or harass the bigger targets while you move to a different spot. The Drone can be sent after low-health enemies to finish them off, or to keep snipers off your back when making a necessary push. Likewise, the Hive is excellent at locking down an angle, perfect for when you know where enemies are going to be coming from. Most skills also feature healing and support options. I am still tweaking my build to find the right setup, but so far having two aggressive skills has worked well for me as a solo player. Skills in The Division 2 are intended to give you breathing room rather than outright devastate. Though these options certainly exist, their cooldowns are long enough that you can’t rely on them for constant carnage. Playing The Division 2 in such close proximity to another recent release in the genre really illustrates how being rooted in the real world was perceived as a challenge for Massive, not a limitation. The post The Division 2’s smart AI and engaging combat makes it easy to forget you’re playing a cover shooter appeared first on VG247.